So you’re finally ready to spruce up your home with a fresh coat of paint, and you want to save yourself a lot of hard work and effort by buying a paint sprayer. But odds are you had no idea how many different types of paint sprayers were out there, and now you’re utterly confused. Here’s four effective and incredibly simple tips to help you buy the best paint sprayer for home use. Unless you’re planning on repainting every surface in your home, doing a huge amount of fine detailing work, and restraining every piece of carpentry you own, odds are you don’t need to look at compressed air sprayers. An airless sprayer is going to be much easier to use, since they are completely self-contained systems, so you don’t have to deal with any troublesome external equipment. Airless sprayers are also typically cheaper, which is definitely a huge plus when it comes to keeping the home improvements from going over budget. 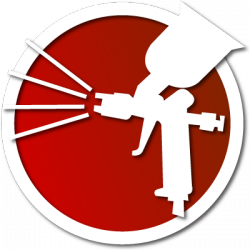 This is probably going to be the biggest feature (no pun intended) that you’ll want to look for in your paint sprayer, as it is what will allow you to get the job done with less effort. Most home painting projects involve painting walls, or some similar broad surface, so having a wide spray fan means that you can paint more of that surface with each pass. Also, being able to decrease the fan width will allow you to paint smaller areas without overspraying and accidentally painting the surrounding area. Even if you plan on taking on several projects as part of your new home painting endeavors, you’re probably not going to be using the sprayer a whole lot. Most home improvement jobs can be accomplished with a paint sprayer gun, where the paint cup and turbine are all attached the main sprayer unit. On the other hand, if you want to do a lot of DIY or hobby painting projects, you could look into an airless sprayer system. These models have a stronger turbine for creating the spray, and have a tubing system for delivering it to the gun. However, they’re generally a bit of overkill for most home projects. It’s very easy to get overzealous when you’re taking on any kind of home improvement project, and that excitement can quickly turn into buying more tools and accessories than you actually need. Take some time to really plan out the projects beforehand so you can get a sense of how much power you actually need. This will help you find a paint sprayer that can get the job done without you spending a ton of money on a tool that you’ll never actually use to its full potential. Remember that painting is a messy project, even with the control and precision that comes from a paint sprayer. You’re going to want to make sure you have tarps, painter’s tape, masks, and gloves to help you keep yourself, and your home, from getting too dirty.